Black Locust (Robinia pseudoacacia) is native to the Appalachian Mountain area, and is considered an invasive tree in other places. It grows quickly, and often in clusters, crowding out native vegetation and aggressively invading fields. The bark of older Black Locust trees is grey and deeply furrowed. The tree can grow up to 100 feet tall, and the trunk is usually crooked. The wood is very strong and rot resistant, often used in posts. The leaves are compound with 7 to 21 oval, smooth edged leaflets. On smaller trees, a pair of thorns grow at the leaf axils. For about only one week in mid-spring, the white flower clusters droop from the trees, making the entire tree appear white. Each flower in the cluster has a yellow spot on its top petal, and the flowers look like pea blossoms. They are crispy when picked, and can be refrigerated or even frozen for later use. They are most fragrant right before opening, or within a day or so. If the blossoms are browned or falling to the ground, it is too late to pick them. The roots of the trees alter the nitrogen content of the soil. Most parts of the tree are toxic, causing digestive system problems. In late summer the tree produces flat, green seedpods that looks like beans containing flat seeds. It is only the flowers that we gather and consume. The best way to eat the blossoms is raw from the tree, and the taste of the raw flowers is sweet like fresh peas. Use them in a salad, or stir them into hot oatmeal. We remove the flowers from the brownish-green cluster stem and add them to pancakes and doughnut batter, or add them to an egg custard. Robert makes a sweet drink with the flowers steeped in water, honey, and lemon juice. Last year we made a peasant wine with the blossoms, and it is fantastic--floral, mostly dry, and wonderfully clarified. 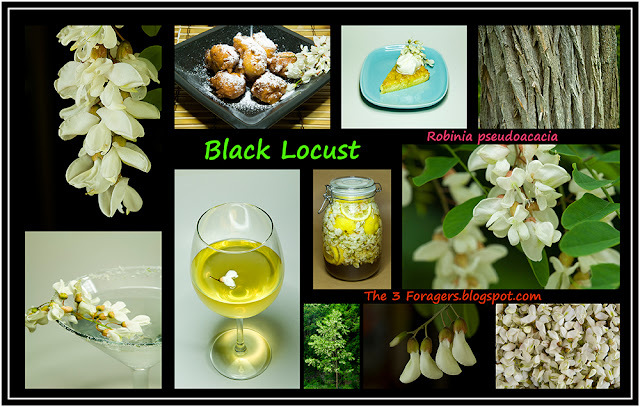 We have also made some black locust flower jelly and some flower-scented sugar. Robert also made a black locust blossom syrup, which we mix with seltzer for a bubbly non-alcoholic cocktail. The blossoms attract lots of bees and ants, and the trees will seem to "hum" with activity as you walk past one in mid-spring. This is a fantastic site~! I saved it in my favorites.